boil your own crabs for this recipe simply remove the large shell, clean and stuff. 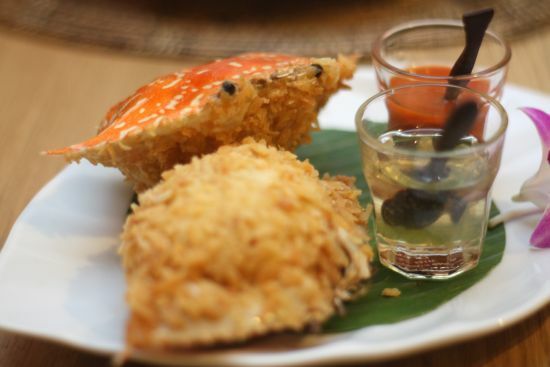 Ghanaian cuisine has diverse traditional dishes one of which is Akotonshi or Ghanaian Stuffed Crabs. You can make your own little “imitation” crab shells by forgoing the crab shells using large hollowed out red tomato, a large red grilled bell pepper or use an attractive red baking dish. Add all ingredients into a large pot just long enough to cook shrimp about 3-5 minutes. Spoon mixture into clean crab shells or baked tomatoes, garnish with green onions. You can stuff a hot chili pepper with the crab mixture for your chili-head friend who loves ghost peppers.